SINGAPORE – A woman escaped injury after a step on the escalator she was riding on at The Arcade in Raffles Place broke. An eyewitness, named only as Mrs Liu, told Chinese evening newspapers that she heard a loud bang coming from the escalator, which runs from the first to the second floor, at about 3.30pm on Tuesday (Jan 5). Two people were riding on it – a man who had just reached the landing on the second floor, and a woman who was about three steps behind, Lianhe Wanbao reported. One of the steps in front of the woman suddenly broke and the escalator stopped immediately, Mrs Liu said. Photos from the scene, including one posted on Facebook by netizen Sandy Low, show an escalator step that seems to have broken into three parts. While the woman was not hurt, she looked shocked and could not speak for a while, and had to be comforted by passers-by, said Mrs Liu. The building is especially crowded during lunch and in the evening, Mrs Liu said, and the escalator is usually full of people. “It’s very lucky the incident did not happen during peak hour, if not it would be terrible,” she told Wanbao. The Chinese daily also said that the area had been cordoned off, and that repair work was ongoing. 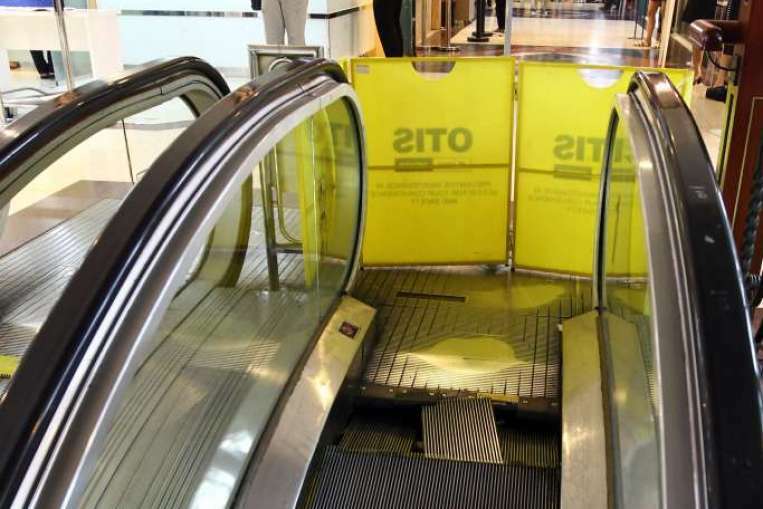 Escalator safety has come under spotlight after a string of incidents in China, including one in July 2015 in which a woman died after she plunged through the flooring over an escalator in a department store, seconds after thrusting her toddler to safety.